Cheesy title, yes. But it describes how I’ve developed my use of various digital and analog tools over the past several years to live in a way that fits my beliefs and brings satisfaction. Is there room to improve? Of course — there’s always room to improve. But my combination of habits and tools is feeling settled and peaceful. And as many people seem interested in these topics, I wanted to share my overall system. Why paper and digital tools? Digital tools are backed up, available on all your devices, and easily searchable. Paper tools enable clarity and add a sense of calm and slowness to your day. You can throw all kinds of things into your digital tools: images, links, text, files, and more. Paper tools give you the flexibility to use them in whatever way suits you best (at least, ones with blank pages). There is no reason to limit yourself to one or the other. In 2018, there are even several options that allow you to automate the process of getting your thoughts on paper into digital form. But that is not necessary: your use of digital and paper tools can complement each other and coincide. Let me share how I do just that. My setup starts at the yearly level. I don’t have any 5, 10, or 50-year plans. I just take time each December to review my year past and plan for the year ahead. If I do well at that, I figure I’ll be in a good place at the end of the journey: however many years down that road that is. So I plan each year with several high-level goals. Now, I call these goals, but many of them are truly habits. Or rather, habits are what will accomplish the goal. If you read much on this topic, you know people like James Clear are singing the praises of habits over goals. And I agree in general. But I feel they go hand in hand. A common example is rather than having a goal of writing a book, just focus on writing 500 words every day. But while that habit is a fantastic one, on its own, it will not produce a book. Those 500 words could live in a daily journal, or 500 words could be combined into one 2,500 word blog post each month. But writing and publishing a book involves more. So while the habit should be the day to day focus, it’s also important to have a long-term goal that you revisit regularly. Each year I set several goals. Things like reading 12 non-fiction books. Run my first marathon. Write 35 newsletters. Be more positive in my interactions with our kids. Have 12 date nights with my wife (oh, settle down you with your 52 date nights … we have four kids and have goals for date nights with each of them. 12 dates is doing pretty good 😀). The overall focus is being able to look back in December and feel that my time was spent on the things that matter most. Each quarter, I list out the things that I need to do to meet those annual goals. And last, on the daily level, I track how I’m spending my time. This is not related to tools that track your actual activity on a computer or anything of that nature (although I use those as well). 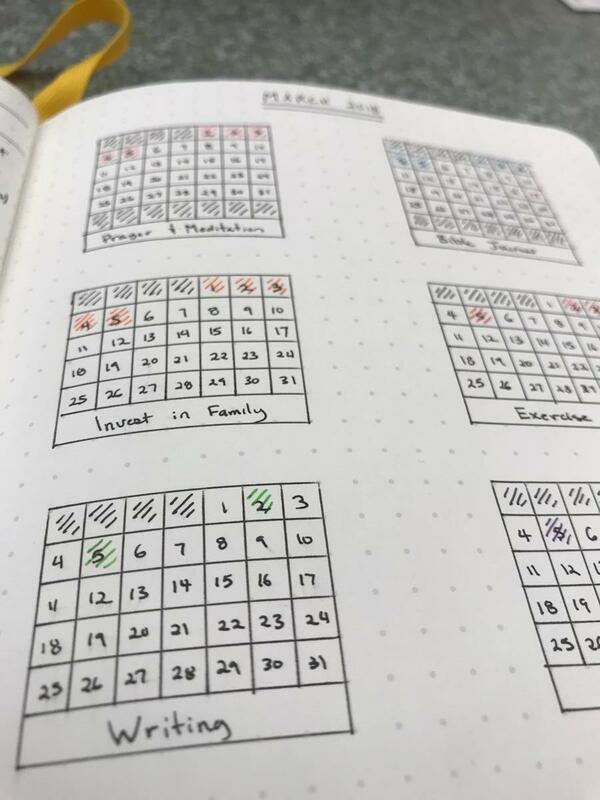 This is where habits come in: I have a list of 8 or so things I want to track daily. 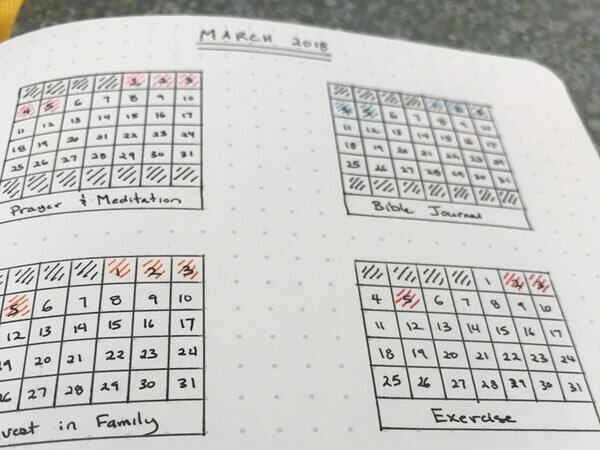 I do not necessarily need to perform each of these activities every day, but I want to track them daily to ensure I’m not going to long without each. Exercise is a good example: running seven days a week is too much. But I do need to complete 3–5 runs each week. This entire process is set up to allow me to get into the details each day, but with a focus back on the higher level as I set up each week. And I use my paper tools for the daily items and digital tools for the long term. There’s a bit of overlap, but this is the basic gist of my system. The tools themselves are not terribly important. Any mix of digital tools like task managers, note, and calendar applications would work for you. But I’ll list my preferences for full transparency (and because I enjoy reading about other people’s setups myself). 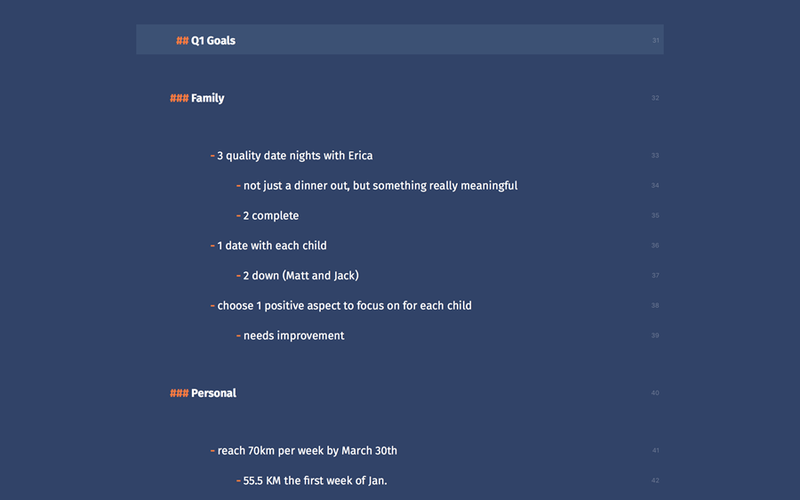 Ulysses: this is where I store all permanent documentation, strategy, planning, and writing. These are the big picture documents that I refer to on a regular basis (such as my life vision document and annual goals). Day One: in contrast, this app is where I store progress on things, the thoughts and feelings I may have, and longer-term thinking. That last item is similar to some stuff I’ll put in Ulysses, but there’s enough distinction to warrant it here. I put ideas for the more distant future in Day One — more concrete plans to achieve those goals and ideas go in Ulysses. And Day One is tied to time. Entries here can be easily recalled thinking of the time, season, and circumstances when the idea first came to me. Things: this is where I track all the work. Where Ulysses may hold strategy, Things includes the actual steps to put the strategy into action. This is also where recurring tasks are stored. Fantastical: last, this is where I get a high level visual of my week(s). When I’m planning my week and choosing my most important tasks, I prefer to use my quarterly goal and calendar (weekly view) side by side. On the physical side, the tools truly do not matter. Not that they are insignificant, but there are so many great options available that people of all kinds of tastes can find something pleasing. Maybe a Bic and a $2 lined notepad are your jam. Or maybe a Moleskine and a fountain pen. Me? I love my Baron Fig notebooks and Muji pens. But the important part is how you use them. What kind of consistent routines and habits do you employ with these tools? Last, I must also give praise for the humble index card. I’ve used cards off and on over the years, but for some reason, I come back to them time and again. I like their ease of use and temporal nature. I use them when my day gets crazy, or I need to break down a larger task into an outline or smaller set of steps. And as I know the card is not going to be a permanent fixture I keep around for years, it gives me a little more freedom. It’s common for me to have a page in my notebook with a weekly plan and an index card stuck inside with a plan for the day. I can go through 3–4 of those in a week. The first, and most important, habit that makes a hybrid system work is regular reviews. To be fair, this is what makes any productivity system work well. But it’s even more vital for this mix of paper and software tools. Because you have items in a couple of different places, it’s important to revisit them on a regular basis. This is important in two ways. First, if you tend to jot down ideas or thoughts in a notebook (capture), some of those items need to get into your digital system at some point (processing). This is where a shutdown routine serves you well. If you take the time every day to review what came your way and set up the next day, you’ll naturally process these kinds of items. Consistent collection and processing ensure you’re not searching through pages of notes on a Saturday afternoon searching for that one thing. Second, I enjoy tracking my habits more on paper than in a digital tool. Again, habits are what will allow us to achieve our goals, to build the kind of life we desire. And there are apps to help with this, but I prefer paper. There’s something about filling in those boxes. Seeing consistency — and the results of that consistency feel wonderful. 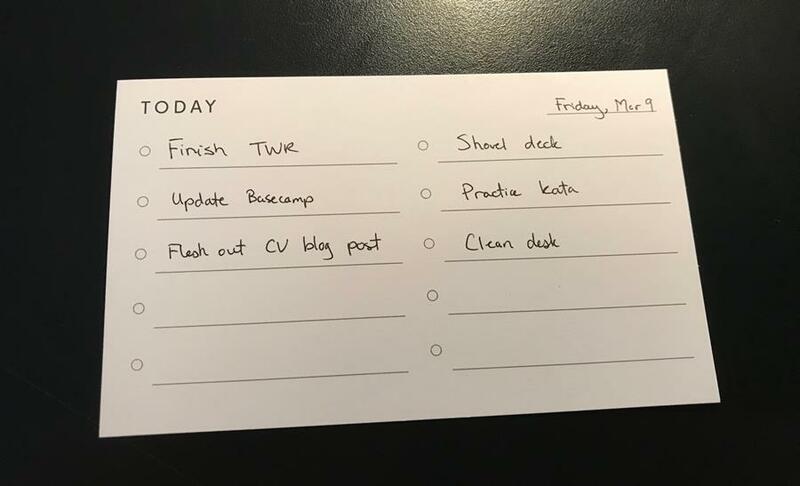 And taking 5–10 minutes in my day to review what I’ve done and physically mark things off brings a lot of contentment that I don’t seem to get from software tools. So this is another area where a hybrid system serves us well. There are some people who happily tap keyboards all day and keep everything in digital tools. But not me. And I suspect, not the majority of knowledge workers today. There’s a connection between our hands and brain that makes using paper calm and freeing. A hybrid system allows us to use that connection between body and mind, while also allowing us to disconnect from the screen and all its various sources of input and distraction. Who doesn’t need a little more of that in 2018? Do you use a mix of tools to organize your life? I’d love to hear about how you fine folks handle this stuff as well. Reply and share the details!